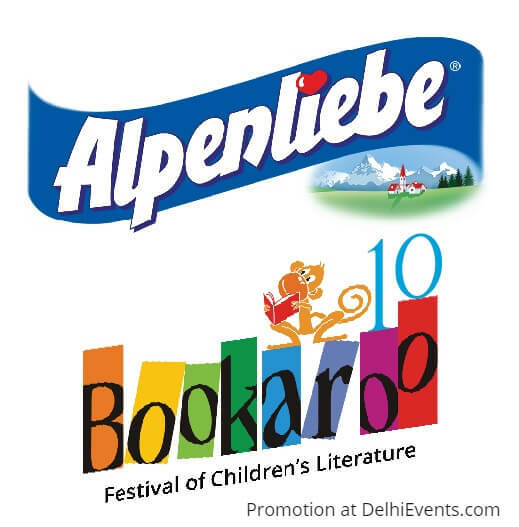 Event Description : KIDS FEST "Alpenliebe-Bookaroo Delhi 2018"
As Bookaroo’s 10-year celebrations reach their peak, Alpenliebe-Bookaroo Delhi 2018 promises to be the biggest-ever. Seventy speakers from thirteen countries are all set to delight children and parents alike in Delhi with some scintillating storytelling, workshops, drama, art & craft and books at the 11th edition of Bookaroo, India’s first children’s literature festival. Two days of non-stop fun with books will unfold at Alpenliebe-Bookaroo Delhi 2018, a collaboration with Indira Gandhi National Centre for the Arts [IGNCA]. The festival will showcase a record 105 sessions for children between 4 and 14 over the weekend on December 1st and 2nd, 2018. Speaking on the collaboration, Achal Pandya, HOD (Cultural Archives), IGNCA, said, "Indira Gandhi National Centre for the Arts is happy to host Bookaroo festival. Bookaroo is one such festival where children and their activities are celebrated at a large scale. Please do come to the IGNCA to be part of this festival on December 1 and 2, 2018 and enjoy books, exhibitions and various other activities. We look forward to welcome you all." As part of Alpenliebe-Bookaroo Delhi 2018, Bookaroo has also collaborated with the Tata Trusts and India Habitat Centre [IHC] to exhibit original artwork from children's books by three winners of the Big Little Book Awards -- Atanu Roy Roy, Proiti Roy and Nina Sabnani at the Experimental Art Gallery at IHC, New Delhi. These artworks are on display until 29th November. On 28th November Proiti will hold a workshop for design school students and on 29th November, there will be a panel discussion on Diversity in Illustrating children's books, from 6.30pm to 8.00pm at the Amphitheatre, IHC, New Delhi. Storytelling: continuous storytelling will come alive under the Banyan tree, as performers from all corners of the earth - New Zealand, South Africa, Australia, South Korea, the Czech Republic and seven other countries present stories as never before! There’s also Qissebaazi, the unique art of bringing regional stories using a bridge language. This time we focus on Sanskrit and Malayalam. BookArt - An exhibition of original artwork from children’s books by three award-winning children’s books illustrators – supported by Parag, an initiative of Tata Trusts.